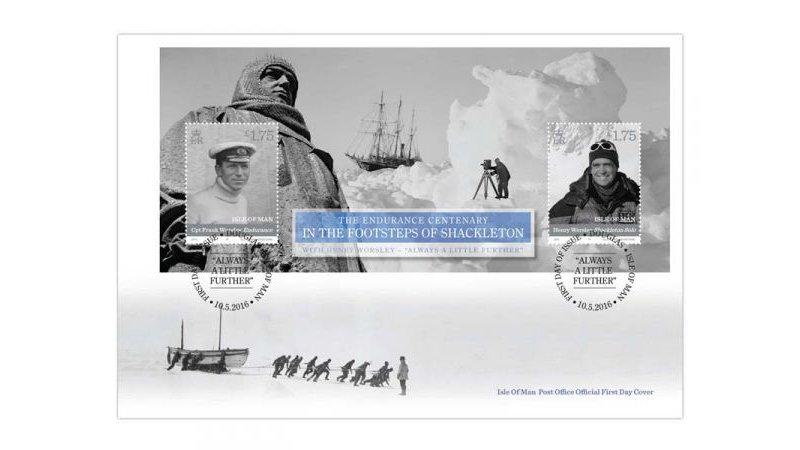 The miniature sheet comprises two 175p stamps: one featuring Frank Worsley, captain of the Endurance, and the other Henry Worsley who undertook the Shackleton Solo Expedition 100 years later. Henry Worsley tragically lost his life whilst attempting this first ever solo, unsupported and unassisted crossing of the Antarctic landmass. 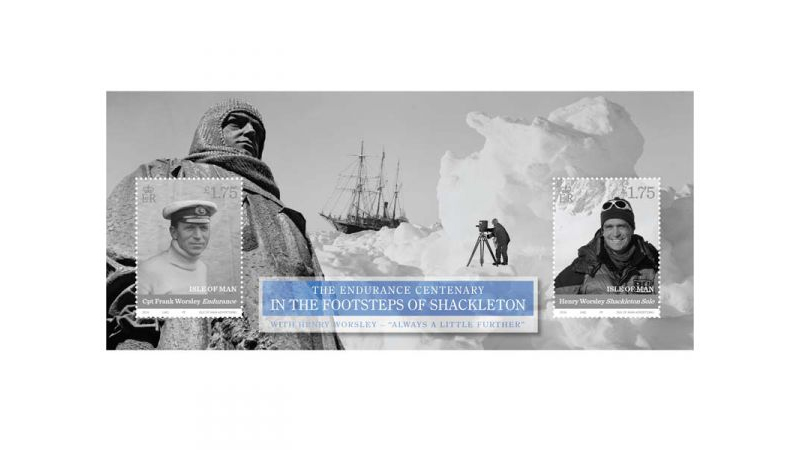 These stamps are set against images of the Endurance expedition by the renowned photographer Frank Hurley which highlight the extremes endured by Shackleton's crew. 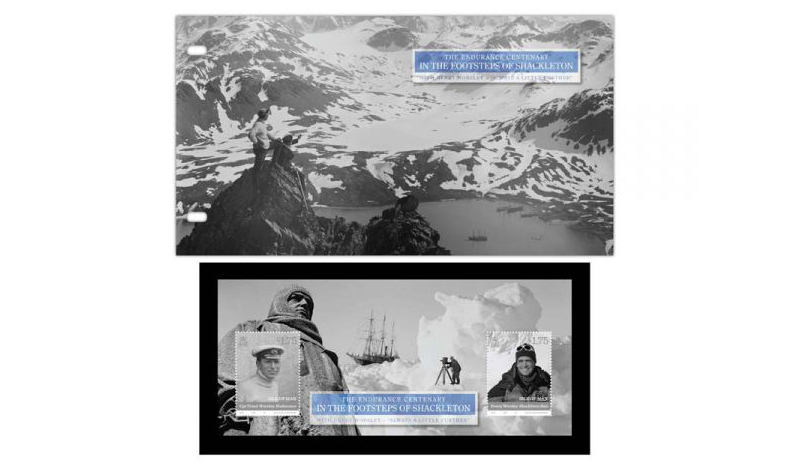 On his third trip to the Antarctic in 1914, with the ship Endurance, Sir Ernest Shackleton intended to cross Antarctica via the South Pole, the last major prize in Antarctic exploration. What unfolded was a story of courage and fortitude which resonates today, 100 years on. Shackleton's hopes were dashed early in 1915, when the Endurance became trapped in the ice. She sank 10 months later, by which time the 28-strong crew had already been forced to abandon the ship to live on the floating ice. Taking advantage of the ice beginning to break in April 1916, Shackleton and his men took to the sea in three small boats, eventually reaching Elephant Island. Shackleton, Captain Frank Worsley and four crew members went to find help not knowing what fate had befallen the colleagues they had left behind. The six men spent 16 days in a small boat crossing 720 nautical miles of ocean to reach South Georgia, arriving safely on 10th May 1916. Amazingly, when rescuers returned to Elephant Island in August the marooned men were all found alive. On 13th November 2015, Henry Worsley set out from Berkner Island, Antarctica, to attempt the first ever solo, unsupported and unassisted crossing of the Antarctic landmass. Henry's ambitious aim was twofold: to raise £100,000 for the Endeavour Fund and to commemorate Sir Ernest Shackleton's intention to cross the Antarctic continent on his ill-fated Endurance expedition 100 years before. Having covered an extraordinary 913 statute miles in the most unfavourable weather conditions, Henry made the brave decision, in Shackleton's words, to "shoot the bolt" only 30 miles short of his goal. Suffering from exhaustion and dehydration, Henry was picked up by Antarctic Logistics & Expeditions and flown to a hospital in Punta Arenas, Chile, where he was then diagnosed with bacterial peritonitis. Despite all the efforts of ALE and medical staff, Henry died on 24th January 2016. In his last statement from Antarctica, Henry demonstrated his own values of selfless commitment and courage. "I set out on this journey to attempt the first solo unsupported crossing of the Antarctic landmass, a feat of endurance never before achieved. But more importantly, to raise support for the Endeavour Fund, to assist wounded soldiers in their rehabilitation". Henry so nearly completed the first unsupported solo crossing of the Antarctic landmass, and in doing so exceeded the main goal of this Shackleton Solo expedition: to raise more than £100,000 for the Endeavour Fund.